I spend a lot of time talking about the importance of Functional Threshold Power in bike training so I thought it would be best to write it up in one place. So here we go…. Your FTP is the highest power you can sustain on the bike for an hour and is determined by how much power you can put out before the lactate (a by-product of exercise at higher intensity) begins to accumulate in your blood faster than you can flush it out, and you get that familiar heavy burning feeling that you causes you to slow down. (You could also measure your lactate threshold, LT, but given the expense and inconvenience of measuring your LT, we stick with the far more accessible FTP test, which gives very similar results). By training at or around your FTP you’ll be able to raise that threshold so that, as your body get more efficient at dealing with the lactate, you’ll be able to go harder for longer. Typically riders will retest their FTP every 4 -6 week, both so you can ensure you are still training at the right level, and so you can track your progress – if it’s not going up then you know you need to adjust your training plan. The test itself is also great (but painful) training. To find out your FTP there are various tests, the most common one being the 20 minute test. If you have access to a Watt Bike or another bike that records your average power for a work out you can do your own test (this is a hard test so you want a good level of fitness before doing it. Another alternative is a 4 min ramp test on bikes such as the Matrix IC7). After a good warm up, start a new workout and then hold the maximum power you can sustain for 20 mins (see the 20 minute test on a Watt Bike). Be aware what feel doable at 5 mins in will not feel doable 15 mins in so start off conservatively. Record your average power for the 20 mins and then calculate 95% of it to get your FTP. For more detail, see Joe Friel, the daddy of triathlon training. Hey. This hurts. A lot. My goodness make it stop. Please. It is also possible to use heart rate to map your training zones (the above WattBike zone calculator link also allows you to calculate this). This can be useful because many of us don’t have power meters out on our bikes in the real world. However be aware that these zones can be quite approximate, and I find many people’s power and heart rate zones don’t quite match up. I would always use power where I have the choice and heart rate as a back-up. Also be aware that you could be a minute or so into the zone before your heart rate catches up so it won’t be much use on shorter intervals. 6 – What are you doing reading this, you should be training for this year’s Tour! Obviously this gives you two ways to improve your result, either lose weight or build your FTP. Your current weight and goals will determine which is most effective for you. If you mostly race short, maximal efforts on the flat (e.g. riding Criteriums or track sprint racing) then you’ll mostly want to focus on building FTP and weight isn’t so important. If you’re regularly riding up hills then losing some weight (depending on your current weight) may also be important. Can you use FTP for running? If you’re a triathlete who also wants to use this approach for your run training the good news is that you can also set your Functional Threshold Pace. The bad news is the test is a whole 10 mins longer and it’s not quite so useful because it sets a pace which would therefore rely on you training on flat ground (or replicating the test gradient) to use it. Again, see Joe Friel for more. Happy training all, let me know how you get on. Weather too grim to get out there riding on the roads? No problem! Here’s an indoor cycle work out and tracklist to keep you building fitness and burning off the mince pies this holiday season. You’ll need a bike that displays your power output and access to the Spotify tracklist below. It’s a nice and simple workout – nothing too confusing to get your holiday-brain head around. But don’t be fooled by its simplicity, it’s certainly not an easy workout. The workouts aim to raise your FTP (see below) meaning that you’ll be able to go harder, for longer, before you get too tired and need to reduce your power. This is a series of workouts that get harder as you go on, so that you continue to build fitness. Judge where you should start (you might be fit enough to start a few workouts in) and then build up each week. If it’s been a hard week with too much eating and drinking and not much training, or you found the last workout too hard, then you might want to repeat a workout before you progress to the next one. Workout 1: 3 x 7 mins (at 80-95% of FTP) with 3 min recovery between each block. Recovery is just nice gentle spinning, keep your legs moving, but don’t work hard. Do make sure you take the recovery, otherwise you won’t be able to work at the right intensity in the next block (if you can, then the workout is too easy, move on to the next one). Cadence stays at 90 rpm. Set the gear so that when pedalling at 90 rpm you are in the right power zone for your FTP. (NB depending on how you are structuring the rest of your training you’ll probably want to take a rest week where you reduce the intensity at some point, and retest your FTP to check if your zones have changed). You’re going to be holding a cadence (the number of times one pedal turns round each minute) of 90 rpm* for the whole work out. And you’re going to keep the same gear for the whole workout for the whole work out (except recovery). Simples, no?! Now the hard bit – you’re going to do the whole ride (except for recoveries) at 80-95% of your Functional Threshold Power (FTP). Put simply your FTP is a measure of the maximum power you can put out before the lactate (a by-product of exercise at high intensity) begins to accumulate in your blood faster than you can flush it out, and you get that familiar heavy burning feeling that you causes you to slow down. By training at or around your FTP you’ll be able to raise that threshold so that, as your body get more efficient at dealing with the lactate, you’ll be able to go harder for longer. It’s a crucial key to your training, both so you can ensure you are training at the right level, and so you can track your progress. Read more about FTP and how to test it here. If you know your FTP, calculate 80-95% of it and line up the tracklist. Jump on a stationary bike (turbo trainer with power meter or indoor training bike) and after your warm up, start pedalling at 90rpm, and work out the right resistance/ level / gear to ensure you are in the target power range of 80-95% of your FTP. Then press play – the tracklist is made up of songs that are all around 90 rpm (there’s a few just below, and a few more at 92 and 94 rpm) so use beat of the music to keep your cadence steady at around 90rpm, and (so long as you don’t touch the gear!) you should stay in the right zone. Don’t worry too much about the exact rpm, out on the road you wouldn’t hold an exact cadence, it’s just a guide. (You don’t need to hold the cadence on the recoveries). If you want to find your FTP then you’ll need a bike that records your average power for a work out. After a good warm up, pedal as hard as you can at a sustained power for 20 mins (for example see the 20 minute test on a Watt Bike) and then work out 95% of your power average for the 20 mins For more detail, see Joe Friel, the daddy of triathlon training. If you don’t have the chance to work out your FTP then you want to be riding at around a 6/10 to 7/10 effort. This is a bit harder to judge because what feels easy enough at the beginning of the work out will feel a lot harder by the end. I’d say probably start at (an easy) 6/10, then make sure you stick to the same watts through the workout. By the second interval it should be beginning to feel more like 7/10, or even worse by the end. If you’re getting bored, or feeling guilty about an extra helping of Christmas dinner, you can throw in a 5 second sprint every 2-3 minutes, then go back to 90rpm for the rest of the interval. Firstly, because sticking at one cadence means you don’t have to worry about constantly changing gear and checking you’re in the right zone, meaning you can instead concentrate on the workout and your technique. But the main reason is to get you used to riding at 90rpm – which is generally recognised as an effective cadence for racing. Many people, especially beginners, tend to ride with quite a low (less than 90) cadence, pushing a heavier gear to get the power. But this will stress the muscles more, meaning that your muscles will fatigue quicker and over the long term, you could be straining vulnerable joints such as your knees. Riding with a higher cadence (around 90) will be working your lungs harder but save your muscles. That’s not to say that you should stick religiously to 90 rpm the whole time, cadence will obviously vary depending on the gradient, there’s definite advantages to training at different cadences, and there’s always variability between different riders (Google Lance Armstrong, Jan Ullrich and cadence for a famous example). And you don’t have to do all the workouts at 90 rpm, so long as you stick to the watts. Give it a go, hope you have ‘fun’ with it, let me know how you get on. If you’re like the majority of people out there, you probably don’t warm up before you run (no, bouncing down to touch your toes a few times before you set out is not the same as warming up!). But the importance of a good quality warm up shouldn’t be underestimated, both to reduce the risk of injury and improve the quality of your run. Whilst you may feel that time spent warming up is time that could have been spent running, just think how much less time you’ll be spending running if you get injured. Or how much better you’ll feel as you start to shave the seconds off your PB! Although there’s lots of conflicting advice around stretching and warming up, most agree that static stretching – the old school style of holding each stretch for something like 30 seconds – isn’t helpful before running. In fact this type of stretching could actually reduce your performance on the run. Instead you want to do “dynamic stretching” – a gentle, moving stretch which will increase the blood flow to the muscles and warm them up, as well as beginning to mobilise and lubricate the joints, reducing your risk of injury. Using dynamic stretches which get the body moving in a similar way to how you do when running, combined with some simple drills, will also help build the connections (or neuromuscular pathways) between your brain and your body. Whilst you can just run on autopilot, if you want to improve your technique and form on the run, then spending some time really focussing on your movements will help improve the quality of the running that follows. If you have access to a foam roller then roll anywhere that’s feeling tight before you go out for your run. Then begin with a brisk walk or very gentle run (for me this is normally going from my house to the park or where ever I’m going to start my run) to start to gently warm up the muscles. Next onto the dynamic stretches. In terms of which stretches to include, think through the main muscles that you’ll be using when running and try and include something using each one. You don’t have to do each stretch for long, I tend to do 5-8 reps on each side, more if I’m feeling tight in that area, less if it already feels loosened up. You’ll soon get to know the areas where you need to spend a bit longer. Here’s a video I’ve recorded with a simple, pre-run dynamic stretch sequence. I’ve included kneeling hip flexor stretch, a hamstring hug (big thanks to James at Kinetic Revolution for this one, it’s one of my favourites), a clock lunge sequence, and a calf stretch and mobilisation. And then onto the drills – these will mimic some of the movements you’ll use in running (but often in exaggerated form) so that you can really focus on the quality of the move. In this run drills video I’ve included some high knees, heel flicks, high knees combined with heel flicks, and then a high skip. I would then go on to some strides – a few sets of 30 sec runs at slightly higher pace than your goal pace for the workout with a good rest between each. Are you looking ahead rather than down at the floor? Are your hips level and your knee straight in front rather than crossing inwards in front of your body? (you can see in this video that my knee comes out slightly as I try and balance up the hill). Are you using your arms for power and are they coordinated with your leg movements? There is no magic number of minutes that you should spend warming up, but as a rule of thumb, I’d say a few minutes with the initial walk or gentle jog to begin warming up, about 5 minutes with the dynamic stretching, and then the drills can either just last for a few minutes each, or much longer if you really want to focus on your technique in that session. Give that a go next time you go out for a run. Let me know how you get on or if you have any questions in the comments section below. Two of the most common things I hear from clients who are trying to lose weight are “I don’t have time to cook” and “I’ve run out of ideas of things to cook”. 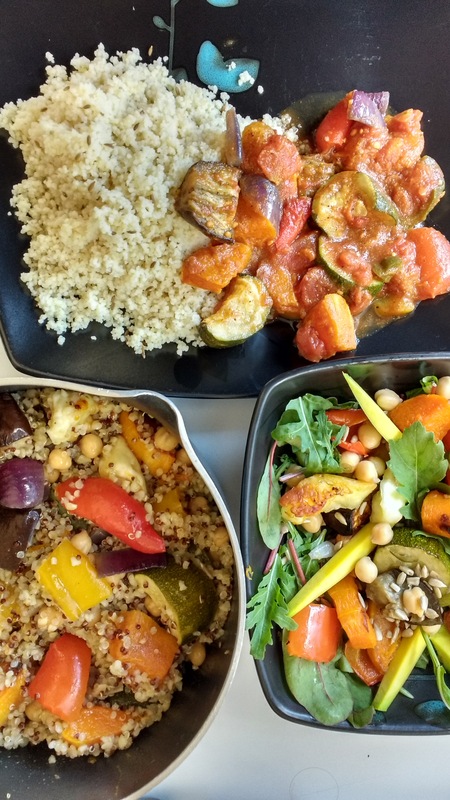 One of my main suggestions is to find a day when you do have a bit more time, and do a big cooking session, and then recycle what you’ve cooked through the week. First of all get a load of different vegetables, chop up into cubes and roast in the oven. 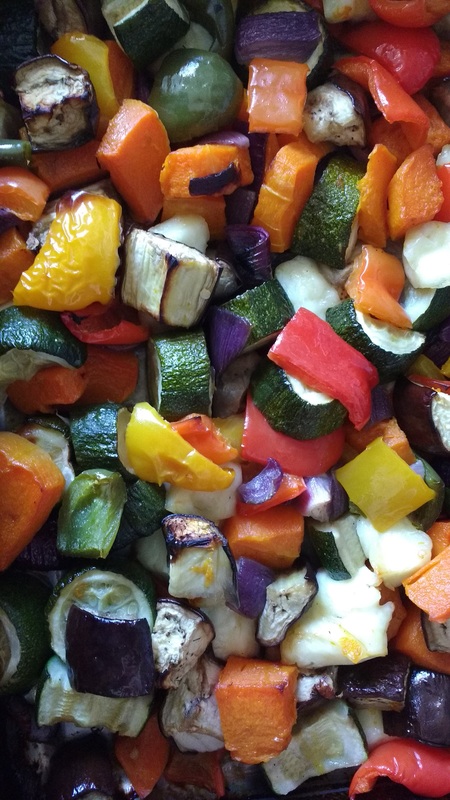 I used sweet peppers, courgettes, aubergines, red onions and butternut squash. 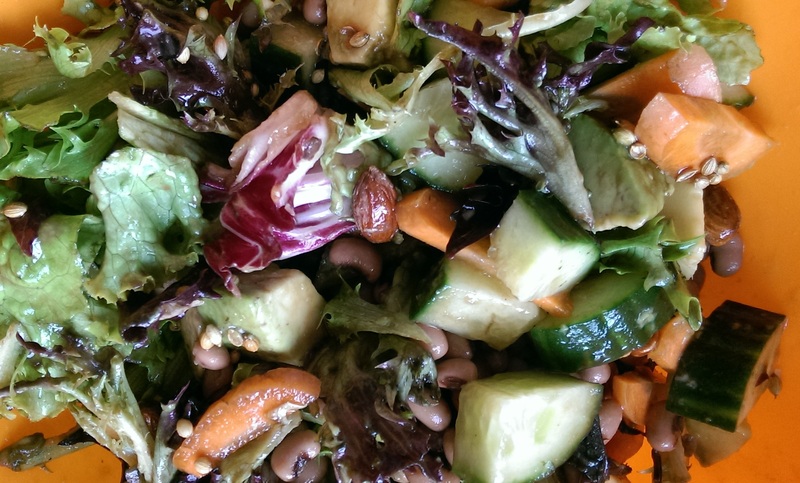 You want to do a lot of veg as this is going to make you 3-4 meals per person. The first meal I’d make alongside the roasted veg, then you can either store the rest of the veg ready to assemble into the next meals, or pre-make the other meals at the same time so they’re ready when you need them. Roast some halloumi (not too much!) at the same time as the veg – put at one end of the roasting tray as you won’t be using it with all the dishes. Boil some quinoa whilst the veg is in the oven (I used a pre-mixed bag of red and white quinoa, and added a little crumble of a stock cube for flavour). Then once the roasted veg and halloumi is ready, mix it with some mixed beans and serve on top of the quinoa. Either eat hot straight out of the oven, or serve cold as a salad (for a salad I’d dress it with some oil mixed with some spices to give it a winter warming salad taste). Serve the roasted veg cold on a bed of salad leaves, you could add some beetroot or snow peas as well for variety and a bit of crunch. 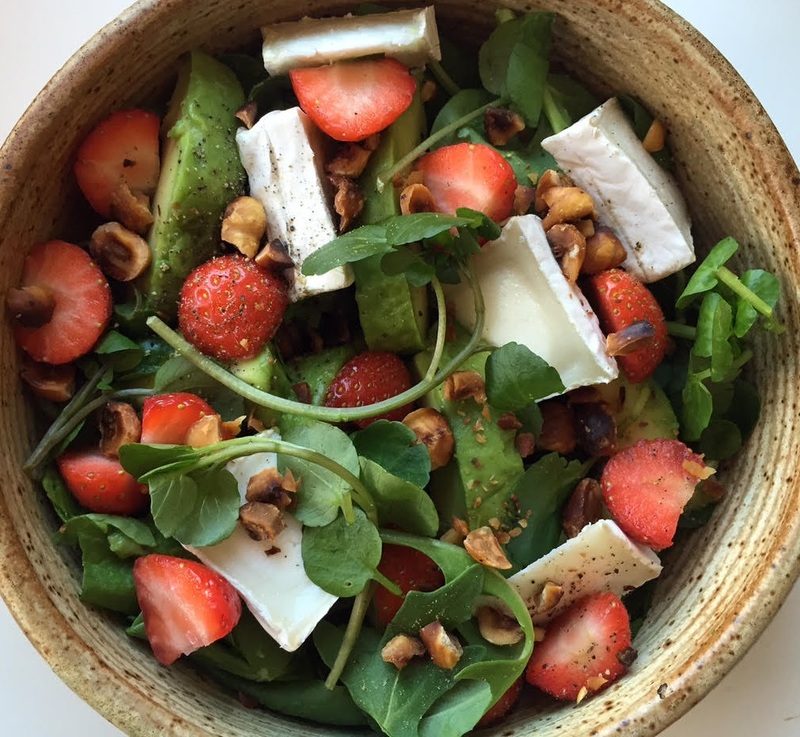 This is a good one for work, you can just pack up the pre-roast veg and buy a bag of mixed leaves, and then put it all together when you’re ready to eat. I’ll often throw in a can of chickpeas or other pulses to add in some protein and make sure that I’m not going to get hungry later. Add a can of tomatoes and your choice of pulse or bean and split the mixture into 2 pans. 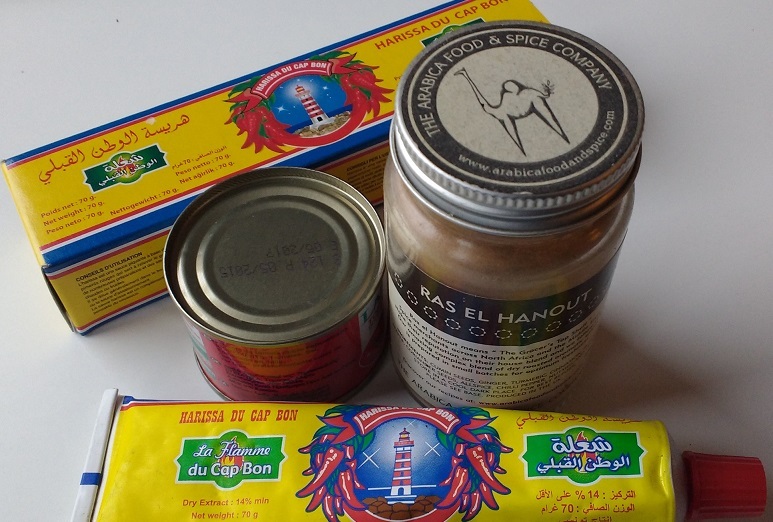 Into the first add some Moroccan style spices – I use either Ras El Hanout (which normally comes as a jar of pre mixed spice) or a generous dollop of harissa paste (this is easy to buy where I live in Brixton and either comes in a small tin or a tube, like tomato puree. It’s great for livening up a stew or a dressing) and then add some orange juice and grated rind and apricots and serve on a bed of couscous (I add some cumin seeds to the couscous for flavour). This is a good one to freeze for another time (minus the couscous) and again, can be taken to work where you just pour boiling water onto the couscous to cook it (leave it covered) whilst you reheat the stew in the microwave – it smells great so you’re bound to get some jealous colleagues peering over. Take the other pan that you put half the veg and tomatoes into, and add another can of tomatoes. Either stick it into a food processor or gently mash with a potato masher. I prefer to keep lots of lumps in there so I just mash it a bit. Add a bit of water if needed. This can be easily frozen for another time. Season with some salt and pepper (I often add a small amount of sugar – less than quarter of a teaspoon, to take away some of the acidity from the tomatoes). 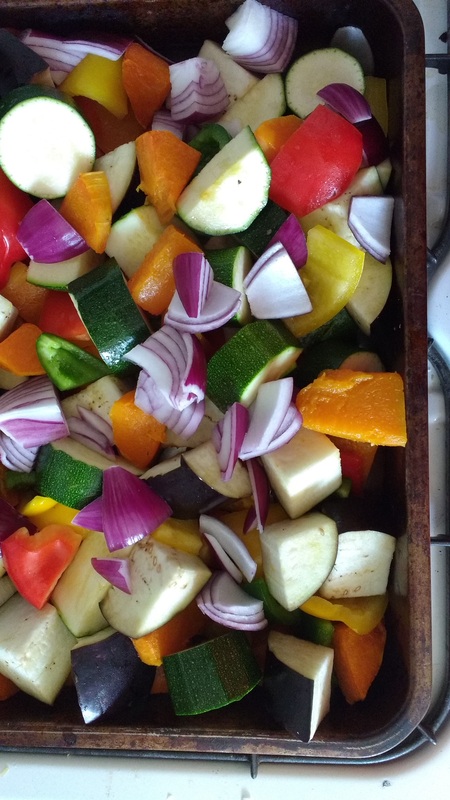 So there you go, after the initial work to chop and roast the vegetables, each of the other meals shouldn’t take more than a few moments to assemble from your pre roast veg.